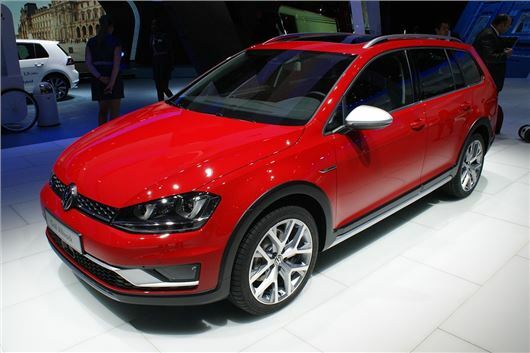 Volkswagen has introduced a new Alltrack variant of the Golf at the 2014 Paris Motor Show. The estate-bodied Alltrack has an increased ride height and off-roader styling, along with 4Motion all-wheel drive. The Golf Alltrack will be available from Summer 2015, and should be priced from around £24,000. Volkswagen will offer the Alltrack with a choice of four engines – one petrol and three diesel. The 1.8-litre TSI petrol produces 180PS and comes with a DSG transmission as standard. Fuel economy is 41.5mpg and emissions are 158g/km. It promises swift performance, with 0-62mph taken care of in 7.8 seconds. The entry-level diesel is a 1.6-litre with 110PS. It’s the most economical variant, with official economy of 60.1mpg and emissions of 124g/km. The other options are 2.0-litre TDIs with either 150PS or 184PS, the former of which produces 127g/km of CO2 and the latter 134g/km. Economy is 57.6mpg or 55.4mpg for the 150PS and 184PS engines, respectively. Externally the Golf Alltrack features more rugged styling than a typical Golf estate, with black plastic body mouldings and different bumpers. Other details include chrome mirror caps and Alltrack specific wheels. Ride height is increased by 20mm to improve ground clearance. In the cabin there are Alltrack specific seat coverings along with unique accents in the centre console and doors. Standard equipment includes climate control, a touch screen infotainment system, driver alert system and cruise control.